Hi Winnie Griggs here. Today I want to tell you a little bit about a man who was very influential in the education of America's schoolchildren - especially in the 19th century. One of the best known text books in the history of the American school system is the McGuffey Reader. Some estimates put the number of these books sold between 1836 and 1960 at over 120 million copies. This places it in a category alongside Webster’s Dictionary and the Bible for number of copies printed. Of course they have continued to sell to this day – at a rate of 30,00 copies a year every year since 1961. The editor of these famed texts, William Holmes McGuffey, was born near Claysville, Pennsylvania in 1800, but grew up in Ohio. The son of Scottish immigrants, McGuffey was raised in a household that fostered strong opinions on religious beliefs and the value of education. These influences carried over into his adult life. An interesting fact about W.H. McGuffey was that he had a remarkable memory and was known to memorize entire books of the bible. At age 14, McGuffey became a roving teacher. His first assignment had him in a one room schoolhouse with 48 students. It wasn’t unusual for the young McGuffey to work 11 hour days, six days a week as he taught in a series of frontier schools in Kentucky and Ohio. And in most of these schools, since few textbooks were available, the children brought their own books, primarily the Bible. During this time, McGuffey also pursued his own education, eventually graduating from Washington College in 1826. Shortly thereafter, he accepted a position as Professor of Languages at Miami University in Oxford, Ohio. A year later, he married Harriet Spinning. 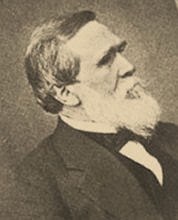 McGuffey soon acquired a reputation as a lecturer on biblical and moral topics. When Truman and Smith, a small publishing firm in Cincinnati, became interested in creating a series of graded readers for primary level students, it was Harriet Beecher Stowe, a longtime friend of McGuffey, who recommended him for the assignment. The year was 1836 and within a year of signing the contract McGuffey completed two of the four books in the commissioned series. For his work he received $1,000. The next year he completed two additional books. The fifth and sixth books in the series were later completed by his brother Alexander in the 1840s. McGuffey Readers contained stories, poems, speeches and essays. They were among the first student texts in the nation designed to be progressively challenging with each volume. The first Reader introduced the alphabet, employed the phonetic method of learning words and other basics. Once a student had mastered those skills, the second Reader used vivid stories and placed an emphasis on understanding the meanings of sentences. The third Reader, which was equivalent of a current 5th grade text, focused on the definitions of words. The fourth Reader taught students advanced reading and comprehension skills. Unlike previous texts which employed uninteresting lists and memorization, McGuffey threaded new vocabulary words within the context of literature, gradually introducing new words while repeating the old. A hallmark of McGuffey’s Readers was their strong moral tone. He believed spirituality andeducation were essential and intertwined in the fostering of a healthy society. The works selected for inclusion in his Readers, besides teaching the basics of reading and grammar, were designed to teach principles of religion, morality and patriotism. They also included themes on nature, games, manners and proper attitudes toward family, God, companions, authority figures, the less fortunate and animals. In these works, right was always victorious and wrong was always punished. The stories emphasized goodness, truth, honor and strength. These books helped to frame nineteenth century America’s morals and values, tastes and character. McGuffey also had strong beliefs on how teachers should conduct their classes. He suggested that teachers read aloud to their students, he listed questions after each story to test comprehension and encouraged teachers to study the lessons as well. Gradually, other texts began to replace the McGuffey Readers in the schoolroom. The call for more rigorous grade distinctions, less emphasis on morality and spirituality, and a changing view of teaching methods speeded up the decline in their usage. But they have never completely disappeared from the scene and are still in use today, especially in the home schooling environment. McGuffey penned very few other works in subsequent years. He advanced in his career in education, taking positions of progressively greater responsibility, including college president, until he retired as Professor of Moral Philosophy at the University of Virginia. McGuffey died in 1873, and is remembered as a great philanthropist and as a man who found success as an educator, lecturer and author. 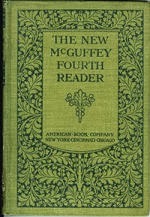 So, do have any actual hands on experience with a McGuffey Reader? Have you used one yourself or had a member of your family talk about using one? If not, have you ever seen one up close and personal? I taught school several years ago and references were always made to the McGuffey readers. Spirituality and morality could certainly be taught today so it wouldn't bother me a bit to see these readers come back. Mr. McGuffey certainly knew his business and shared it with many. Hi Melanie! I agree that McGuffey knew his business and seemed very dedicated to his mission as well. I had a set of McGuffey readers when I homeschooled my children. They were more of a fun additional reading material. We found some of the stories unrelateable to our modern world. It has been many years since I homeschooled so my memory is a bit dim. My children enjoyed reading some of the stories when we read the Little House On The Prarie series of books.McGuffey readers truly revolutionized America's education system by making learning consistant throughout the country. Winnie, love your post. I' read some McGuffey stories as research for a novella I was working on about a schoolteacher. Many of the moral lessons are still relevant today. People sure did grow up fast back in those days. . Can you imagine a 14 year old today teaching a class of 48? Most adults can';t handle that many students. Margaret - being a teacher at ANY age seems a daunting task to me - it is a special kind of calling. And yes, for a 14 year old to tackle the job is amazing - one wonders how he maintained order with the older children. Hi, Winnie! It sounds like McGuffey readers were wonderful books! I wish the readers of today emphasized morals, values, and other strengths of character. Thank you for sharing this delightful post! We still have a set of McGuffey Readers which I used when we homeschooled our children. That was many years ago(!) when the the Homeschool movement was in its heyday. My daughter is planning to homeschool her son next year, and I'll lend her our set if she wants to use them. Some of the stories are so nostalgic and interesting to read. Hi Donna - thanks for stopping by! And how wonderful that you're able to pass those on to your daughter and grandson. Hi Sharon - thanks for stopping by. And very cool that you got to use them yourself. We too used McGuffey readers in our home school. Many years ago.... Just recently we visited the Henry Ford Village in Dearborn, MI and walked through McGuffey's school house and home. Sounds like this was a smart man. Wish they would use them in Texas schools. Didn't know any book compared with the BIBLE in sales. I have never had one or heard of anyone I know that used them. Thanks for the post Winnie.